With ageing populations and increases in chronic disease, most of us will be patients in the health care system one day. It’s just a matter of time. How can we be ready to navigate the waters of the health care system with confidence and certainty? 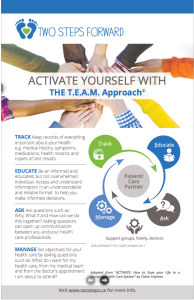 A T.E.A.M Approach © helps provide you with a simple and easy-to-remember tool that can help you transition to an active participant in your healthcare. 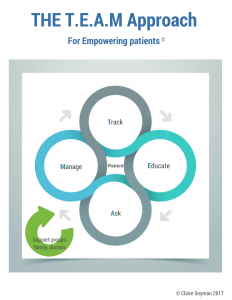 It can be used by patients and caregivers as well as healthcare professionals who are looking to engage more with their patients. Engaged patients more likely to stay on treatments, are more willing to take responsibility for their care, take preventative measures and seek early diagnosis. This is how you can put your health in your own hands!